4/25: Yes Any size dogs are welcome with approval. 10/25: Attached Master Bath has new vanity with granite top and a tub/shower. 11/25: Queen bedroom with nautical artwork. This condo has been totally redecorated and renovated --everything is brand new. The entire has new tile, bathrooms, kitchen, granite, etc. condo has been freshly painted (walls, ceiling and trim), new sofa, loveseat and chair, new window treatments, new lighting new beds and bedroom furniture, new dishes, pots, pans, etc. You will be pleasantly surprised by all the 'extras' in our home that you would not normally find in a rental unit. No need to pack up your porta-crib, high chair, or sand toys, we have them all! Our large 2nd floor condo is a great place for a family to use alone or to share with friends. The Master suite has a King size bed with Egyptian cotton sheets, night stands, reading lamps, large dresser, large closet and HDTV. There is a sliding glass door with an attached balcony off the master bedroom with VIEWS of the water. The sliding doors have room darkening drapes (so you can sleep in or take an afternoon nap while on your vacation). The attached full bathroom has a new vanity with granite countertops, tub/shower combination, hair dryer and large fluffy bath towels. The 2nd bedroom has a Queen-size bed, with Egyptian cotton sheets, night stands, reading lamps, chest of drawers, closet and HDTV. The second bathroom is easily accessible from the hall and features a new vanity with granite countertops, tub/shower combination, hair dryer and large fluffy bath towels. In our main living area we have a very comfortable queen size sofa sleeper, and loveseat with reading lamps nearby. There is a SMART HDTV with internet capability so you can use easily use your Nextflix or Hulu accounts to watch your favorite programs, a DVD player and an iPod docking station stereo. The living room also opens up to a large (35 foot) balcony with views of the water. The balcony features a large dining table and 6 chairs. Even if you don’t like to cook, you’ll discover your inner Emeril Lagasse or Julia Child in our dream kitchen. You’ll love cooking using our Calphalon Professional Cookware. And even the most dreaded task—doing the dishes—is somewhat enjoyable using our extra-large sink. We, of course, have equipped the kitchen with all the necessities such as a dishwasher, toaster, microwave, ice-maker, blender, ample plates, glasses, wine and beer glasses and kitchen utensils. There's also a Keurig K-cup, as well as a regular drip coffee maker. For your convenience, we supply many “extras” such as cleaning products, trash bags, aluminum foil, plastic wrap, sugar, creamer and spices. The Dining area features an extra-large dining table with 6 chairs chairs. For your convenience, we also have a Full-Size front-load washer and dryer, and iron and ironing board. And if you would like to keep up with friends, family or work while you are away, we provide free high-speed internet and WiFi. Lastly, our condos are pet friendly! Any size dogs are welcome (yes, that means we welcome even large dogs--sorry NO Cats! ). Maravilla has a dedicated dog walking area and there are plenty of sidewalks for longer walks. There is a $200 extra fee to bring your dog along and must be pre-approved by the owner. 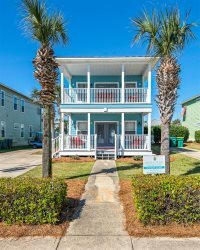 Maravilla is the one of the most popular family resorts in Destin. It’s a low-density resort (only 4 stories which means fewer people on the beach!) It has a 2-acre PRIVATE beach and plenty of green space for the kids to run and play safely. Maravilla also features 2 swimming pools (one heated), a hot tub, BBQ grills, tennis courts, shuffleboard, and a basket-ball hoop. Centrally located on Scenic Gulf Drive (near the outlet mall and Pompono Joe's), it is very close to local attractions, restaurants, grocery stores and shopping. Beachfront: Complex is Beach Front. Maravilla owns the private, undeveloped beach. We're a low density complex so our beach will not be as crowded as you would find in other complexes. It's just a short walk (about 150 yards) from our doorstep to the water's edge. Beach View: We're on the second floor in the building on the right hand side as you are looking at the complex from the beach.